This is a copy of a publication in Law Enforcement Executive Forum, July 2005. Also available in pdf format! Reviews by Jacqueline Ross, Anna-Maria Marshall, and David Cunningham, with a preface and response by Mathieu Deflem. Please cite as contributions in "Book Symposium: Policing World Society." Law Enforcement Executive Forum 5(4):63-82, July 2005. 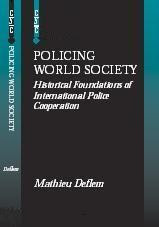 This symposium offers a discussion of issues raised by Mathieu Deflem’s book, Policing World Society: Historical Foundations of International Police Cooperation (Oxford; New York: Oxford University Press 2002, paperback: 2004). Deflem’s book presents a historical study of international police cooperation in the period from the middle of the 19th century until the end of World War II. The emphasis is on international police work with involvement from U.S. and German police. Although historical in orientation, the book presents themes of discussion that also relate to international policing issues that our world faces today. This symposium extends from an Author-Meets-Readers Session that was held at the Conference, “Undercover Policing and Emerging Enforcement Powers,” which was masterfully organized by Jacqueline Ross at the University of Illinois, Champaign, IL, March 2005. The reviewers and author are grateful to Editor Vladimir Sergevnin for publishing this discussion. Scroll down for preface by Mathieu Deflem, reviews by Jacqueline Ross, Anna-Maria Marshall, and David Cunningham, and response by Deflem. The bureaucratization theory maintains that public police institutions historically reveal an increasing tendency towards independence from the governments of national states. Police bureaucracies achieve institutional autonomy on the basis of a purposive-rational logic to employ the most efficient means given certain objectives that are rationalized on the basis of professional systems of knowledge. As a result of these developments, police institutions can form international cooperative structures with wide multilateral participation. Yet, as state bureaucracies always remain related to the political power of governments, the degree of their institutional autonomy will vary and have variable implications, depending on social conditions, especially attempts by governments to politicize bureaucratic activity during periods of intense societal upheaval. Intense social disturbances typically lead to attempts to redirect bureaucratic activity to again play a role intimately related to the political goals of national states (politicization). In the case of policing, periods of societal upheaval are seen to affect the institutional autonomy of police institutions in functional and organizational ways. In 1851, the first modern international police organization was established in the form of the Police Union of German States. Active until 1866, the Police Union brought together police of seven sovereign German-language states, including Prussia and Austria, with the express purpose of policing the political opposition of established autocratic regimes. Ironically, from such political efforts would gradually grow police organizations and practices with distinctly criminal objectives. Throughout the latter half of the 19th century, police institutions developed and expanded professionally justified systems of policing and forged cooperation on the basis thereof. In 1898, a striking re-politicization attempt occurred when the Italian government organized the Anti-Anarchist Conference of Rome to organize an international police structure against the anarchist movement. Although a follow-up meeting was held in St. Petersburg three years after the assassination of U.S. President McKinley, independent developments in the bureaucratization of the police function prevented these political efforts from interrupting the strategies which police institutions had developed beyond any political conventions. Next to the disruptive impact of World War I, another striking example of the shifts brought about in bureaucratization during sudden crises occurred after the Bolshevik Revolution in Russia, when police institutions in Europe and elsewhere turned attention to the presumed spread of a global communist movement. But, once again, such politically motivated police activities would be only temporarily relevant. During the 1920s, when a fragile international peace had been accomplished, renewed efforts were made to normalize international police practices and establish an international criminal police organization with broad international participation. These attempts include the International Police Conference, which first convened in New York in 1922, and its (successful) European counterpart, the International Criminal Police Commission (ICPC), the forerunner of Interpol, which was founded in Vienna in 1923. The formation of the ICPC emerges as one of the most central developments in my book, as the organization best exemplified the professional goals of international police cooperation beyond any political divisions. Yet, showing the variability of the conditions affecting institutional police autonomy and the continued persistence of nationally defined goals even in international police work, the ICPC from the 1930s onwards came under Nazi influence. Refounded in 1946, the international police organization would again resume its activities and continue to expand. Policing World Society is an extensively revised version of my doctoral dissertation which I completed in 1996. I originally developed the idea for the topic when, during another research project at the Regenstein Library in the Summer of 1993, I per chance stumbled on a German article written in 1926 under the title, ‘international cooperation of criminal policing’. The article immediately aroused my interest and inspired me to adopt the rather simple idea that the internationalization of policing could not be altogether new. When I first approached my doctoral advisor with the vague plan to write ‘something’ about the history of international policing, at that time focusing largely on the German context, he thought the idea sounded ‘parochial.’ But by the time I had written a proposal, he too was excited about the project. In January 1994, I submitted my proposal to the National Science Foundation (NSF), and a few months later I received a phone call from NSF. In the case of the NSF, phone calls are good news —letters or emails are not, as I have since discovered. The NSF grant allowed me to spend an entire year doing research at archives and libraries in Germany, Belgium, and here in the U.S. Thereafter, I wrote the dissertation in combination with teaching duties and the dreaded search for a real job. I discovered that the hardest part of a dissertation is its actual completion. Fortunately, I could rely on the advice given to me by political scientist John Bendix: “Remember, it doesn’t have to be brilliant; it just has to be finished!”. Starting in the Fall of 2000, I sent synopses of my manuscript to about eight university presses, all of whom rejected the project out of hand. While this reluctance to even have a look at my work was partly due to the boorishness of at least one editor, it was mostly due to a lack of recognition of the relevance of my research topic. Social scientists and their publishers generally do not care much about policing. After shopping for a publisher for almost a year, two editors were finally interested. The subsequent review process was very speedy and generous. I received the final review from the publisher in August of 2001, about two weeks before the events of September 11. Like the police, I did not foresee those events, and, as has been the case for the police, the impact on my work has been considerable. The suggested revisions to my manuscript were completed by January of 2002. Given the enormous impact of the events of 9/11, I wrote a final section in the book, entitled ‘September 11,’ that offered some provocative and rudimentary thoughts on the function and organization of policing since and because of 9-11. The events of September 11 have had a dramatic impact on my work. Not only have I focused my empirical research, over the past two years, on the police dimensions of counter-terrorism, September 11 has also impacted how my work is received. Until 9-11, most of my colleagues thought of my research area as interesting but somewhat quaint. Since 9-11, my work is seen as highly relevant. My book has also been generously reviewed by the scholarly community in the areas of sociology, criminology, police studies, law, and international studies. Debate is an important part of our work. It is a necessary condition for wisdom. In that spirit, I am very grateful to the scholars who wrote for this symposium and to Vladimir Sergevnin for publishing it. The shift from political policing to criminal enforcement duties occurred gradually. Initially, cooperating police agencies sought to redefine political offenses in more neutral terms, describing anarchism as a strictly criminal matter that had “no relation to politics” and “could not under any circumstances be regarded as a political doctrine.” Over the course of the Nineteenth Century, efforts to band together against political dissenters gave way to the pursuit of “international criminals” like “money swindlers, passport, cheque and currency forgers, hotel and railway thieves, … white slave traders and ... drug traffickers.” In the wake of World War I, European governments sought to revive political policing to prevent the spread of Communism, but international efforts to cooperate based on explicitly political goals remained ad hoc, short-term, and involved mainly unilateral or bilateral ventures, “fail[ing] to become a basis for the formation of an international police organization.” With the formation of the International Criminal Police Commission (ICPC) in 1923, police institutions again focused their most successful cooperation efforts at criminal (rather than political) enforcement. The ICPC organized international conferences, established coded telegraph and radio communications, facilitated the exchange of information about wanted criminals, and established specialized divisions to assist in the dissemination and standardization of new crime control techniques. These explicitly technical and nonpolitical tasks intermittently gave way to national political interests, as when Germany’s annexation of Austria paved the way for the gradual takeover of the ICPC by Nazi officials and ideology. But despite their disruption by the First and Second World War, international policing ventures always re-oriented themselves to ordinary crime, permitting police representatives from heterogeneous nations to find common ground and work together on an ongoing basis, despite the political and ideological differences that divided their governments. Deflem’s own explanation for the trajectory of international policing takes as its starting point Max Weber’s claim that state authority resides in its administrative apparatus. Over the course of the Nineteenth Century, modern nation-states developed sophisticated bureaucracies that performed specialized duties. National police forces came to be staffed by increasingly well-trained personnel committed to an elaborate system of rules and procedures and subjected to a hierarchically ordered chain of command. These specialized police institutions developed to deal with new social problems that accompanied increases in population size and density. The new police bureaucracies developed an “independent police culture based on professional expertise,” which in turn allowed them to acquire greater autonomy in devising investigative tools and, eventually, more control over their institutional agenda. This institutional independence, Deflem argues, enabled national police agencies to “move away from the directives of their governments [so as] to independently plan and execute a variety of international activities.” Acquiring technical expertise and a distinct professional identity was conducive to international cooperation because these developments helped create professional standards on which cooperating agencies could converge. In addition, joint policing ventures validated new police skills and technologies and reaffirmed the prestige and independence of national agencies at home. Deflem’s account helps explain why American efforts to establish international police organizations were so strikingly unsuccessful by comparison with European initiatives. Deflem usefully juxtaposes the efficient police bureaucracy of Nineteenth Century Germany with the much less advanced police institutions in the United States during the same time frame. Close ties to local politics, dependence on political appointments, and high rates of corruption meant that American police forces took longer to develop the kind of institutional independence which Deflem views as a structural precondition for international cooperation. U.S. distrust of national police forces, which Americans associated with autocratic rule, delayed the development of federal law enforcement capabilities as well as U.S. interest in international ventures (beyond those that the U.S. established bilaterally with its neighbors.) In addition, the political purposes that initially motivated European cooperation in the Nineteenth Century repelled American law enforcement agencies. They rejected European-style political policing and embraced a narrower conception of law enforcement duties focused primarily on ordinary crime. Deflem’s model also helps explain why the increased professionalization and institutional independence of American law enforcement agencies did not do much to tie them into international policing ventures. Even after American agencies had come to approximate Deflem’s structural preconditions for international cooperation, they still lacked the “motivational basis” to cooperate, namely, a concern about international crime. American law enforcement was more interested in interstate cooperation than in working with overseas agencies. When they did worry about international crime, American police forces concentrated primarily on controlling U.S. borders, which did not require multilateral initiatives. Those international policing institutions that originated in the United States—such as the International Association of Chiefs of Police, which started out as the National Police Chiefs’ Union in 1893 and was renamed in 1901, and the International Police Conference, formed in New York in 1922—did not attract much international participation or take much interest in international crime. Participating American agencies, Deflem argues, lacked a strong interest in cooperating with foreign police forces, using these nominally international agencies more to promote police reform at home and to present a professional face to the outside world than to address concerns about international crime. Indeed, despite his skepticism about functionalist explanations for crime control strategies, Deflem recognizes that the realities on the ground at least partly account for American disinterest in overseas policing initiatives. In contrast to the close proximity of smaller nation-states on the European continent, the greater distance and geographic isolation of the United States made international cooperation, at least of the multilateral variety, less urgent in the Nineteenth and early Twentieth Centuries. Technologies of transportation and communication had not yet advanced far enough to threaten the United States with spill-over from European crime. Although Policing World Society stresses the importance of concerns about “international crime” as the motor of successful cooperation, Deflem’s historical account of police cooperation does not project a simple linear development from political tasks to criminal enforcement. Instead, he notes “national interests remain paramount in the planning and execution of international police activities and organizations.” Participation in international initiatives “always continues to serves national policing interests,” and these may interfere with cooperation in times of armed conflict, such as the two world wars. During times of intense national and ideological struggle, including the aftermath of 1848 and the First World War as well as the Cold War, the police realign their objectives with the embattled ideologies and military aims of their governments and thus become re-politicized. The police only reorient themselves to international cooperation and to shared concerns about crime once they have regained some measure of institutional independence and bureaucratic autonomy. Policing World Society aptly illustrates the variety of ways in which national interests influence international police cooperation. National police agencies realign their objectives with the political goals of their states not only in times of ideological or military conflict. National interests also influence the pursuit of ordinary crime. The prestige of French policing agencies was at stake when French delegates to the First Congress of the International Criminal Police in Monaco in 1914 proposed: the establishment of an international mobile police force along French organizational lines; the international adoption of French identification methods (known as anthropometry or Bertillonage); and the use of French in all international police communications. Likewise, Germany’s active participation in cooperative police initiatives after World War I served to normalize Germany’s standing in the community of nations and to enhance the prestige of Weimar institutions. Germany’s interest in reforming Weimar police institutions to make them more politically accountable and less invasive of fundamental rights also motivated German police contacts with American counterparts, who in turn hoped to acquire German technical expertise. Though Deflem discusses the ways in which international police cooperation promotes national interests, he might have gone further in exploring the ways in which interagency rivalries influence international cooperation. Deflem does provide an example of how interagency rivalries impeded American participation in the ICPC. After the FBI relinquished its membership in the ICPC, the FBI pressured Congress to enact legislation that preserved to the Justice Department (and thus the FBI) the exclusive right to represent the United States in the ICPC, should it decide to rejoin it in the future. In this way, the FBI prevented its rival, the Treasury Department’s Bureau of Alcohol, Tobacco and Firearms (ATF) from taking the FBI’s place. But Deflem does not explore the possibility that similar inter-agency rivalries influenced the decision of other states’ police forces to participate in international ventures, or the nature of their international role. Deflem tells us that improving cooperation between different German states was one of the aims of the Police Union of German states, in 1851, and one of Germany’s reasons for participating in international police initiatives during the Weimar Republic. But it would have been useful to examine the ways in which international cooperation promoted that goal—or the ways in which the international roles of German police agencies reflected or perhaps counteracted differences in professional status and prestige. Because Germany achieved political unity later than its European neighbors and radically altered the terms of its statehood after becoming a republic, the relationship between state police agencies in a country still struggling with centralized state authority might have offered useful parallels to or contrasts with the relationship between decentralized American police forces or the rivalries between nascent federal law enforcement agencies. Indeed, even French participation in international organizations might have been influenced by domestic law enforcement rivalries, despite the fact that France could boast a much more centralized police administration than the U.S. and Germany. Whether Gendarmerie, Customs and judicial police all participated in the ICPC –and how they got along -- might illuminate the influence of inter-force rivalries on the agencies’ international agenda or their pursuit of an international role. Deflem’s claim that “bureaucratic autonomy” promotes international cooperation would have been even stronger had he disentangled two elements of that concept. Having well-defined institutional interests is not necessarily the same thing as enjoying independence from the “political centers” of government. Highly differentiated and professional organizations may well have strong institutional interests in promoting their particular area of expertise, like the investigation of organized crime, to mention a modern-day analogue to older preoccupations with the “international criminal.” But that does not necessarily make them autonomous. Even the most inward-looking bureaucracies have needed to re-orient themselves after 9/11 and investigate terrorism when their government’s enforcement priorities changed. While Deflem defines bureaucratic autonomy as independence from the political centers of government, he also notes that the same police organizations can draw closer to the centers of power and realign themselves with dominant political ideologies during times of international conflict. Indeed, the FBI in the Hoover era provides a vivid example of a highly professional police organization that pursued a political (anti-communist) agenda. Distinguishing between the rise of professional police bureaucracies and claims about their independence from political influence would help Deflem account for apparent counter-examples to his claim that “bureaucratic autonomy” is a precondition for successful multilateral cooperation. Specifically, the adoption of highly political enforcement priorities did not prevent Nazi Germany from participating in the ICPC. The Nazis’ racial policies and politicized definitions of crime did impede cooperation with other member states. But Deflem notes that the Nazis nonetheless achieved some successes by using their control of the ICPC Presidency after the annexation of Austria to promote “proactive passport measures” that presumably assisted the Nazis in tracking down refugees and opponents. In Deflem’s recounting, Nazi Germany employed the Nazi-dominated ICPC to solicit multilateral cooperation and to maintain the appearance of diplomacy even after the war broke out, actively soliciting FBI participation and assistance in providing passport information as late as 1939 and 1940. But though Nazi Germany’s police did not enjoy autonomy from political influence, they retained many of the characteristics of a modern police force. This suggests that the formation of professional police bureaucracies and the development of specialized and standardized enforcement expertise may be a more important precondition for international cooperation than independence from political influence. Whether international policing initiatives coalesce around ordinary crime or more politicized objectives may depend on a host of historical circumstances, including the ability of one state to take over the leadership and dictate the agenda of an international organization and the willingness of other states to acquiesce in the power-grab on the eve of invasion and war. That Eastern European police agencies left the ICPC in the early years of the Cold War may be explained not only by their lack of independence from politics. In light of Czechoslovakia’s unsuccessful attempt to harness ICPC warrant procedures against political exiles, the departure of Eastern European police forces may also reflect their inability, in a highly polarized world, to influence the enforcement agenda of the ICPC or to repackage their objectives as politically neutral. Of course, if police agencies from one state or one political block may succeed in hijacking an international police organization, this does not undercut Deflem’s claim that cooperative ventures focused on ordinary crime may prove more successful and stable in the long-run than efforts to pursue more politicized objectives. The role that the ICPC played in the past does not necessarily ensure that police organizations with broad-based, multilateral participation will remain central to international police cooperation. In the latter half of the Twentieth Century and the early years of the Twenty-first, national police agencies have developed a variety of different strategies for cooperating. Frequently, American law enforcement agencies conduct transnational criminal operations directly with foreign counterparts, particularly drug trafficking and money laundering investigations. In doing so, cooperating police forces bypass international organizations altogether. Throughout the 1970s, 80s and 90s, federal agencies such as the FBI, DEA, and Customs initiated joint investigations with a variety of western European police forces that yielded multiple prosecutions. Precisely because Interpol lacked an independent investigative capacity, serving as a clearinghouse for information rather than a source of operational manpower, direct contacts between American and European officials proved a more effective avenue for infiltrating criminal organizations. At the same time, multilateral working groups and police organizations like Europol continue to play an important role in facilitating international police cooperation. But because they, like Interpol, lack independent operational powers, they play a bigger role supporting transnational criminal investigations than in initiating such ventures themselves. This will probably remain the case, since German suggestions to give Europol some national enforcement powers have encountered predictable resistance from nations unwilling to cede sovereign powers to organizations they cannot control. There are other ways too in the which the past may prove a poor predictor of the future. Although international police cooperation sprang up with little support from treaties and legal reforms, legal norms and diplomacy may come to exert increased influence on international police cooperation. Here are some examples. First, mutual legal assistance treaties permit police and prosecutors to collect and share evidence across jurisdictions. These agreements help transform mere information into admissible evidence. Likewise, international agreements requiring governments to permit controlled deliveries of contraband have provided vital assistance to transnational drug trafficking investigations. When the police identify narcotics shipments, their interest focuses much more on the traffickers who take receipt of the shipment than on the couriers who transport them; the recipients, not the couriers, are the vital nodal points for international drug trafficking networks. But following narcotics shipments to their intended destination requires the police to obtain the cooperation of police and prosecutors from all the different national jurisdictions over whose territory the shipment will travel. Local officials are naturally reluctant to permit smugglers and contraband to cross their territory unimpeded, or to permit foreign police agencies to follow such shipments onto their soil. International agreements permitting “controlled deliveries” establish the legality of this investigative technique and commit the signatories to relinquishing their sovereign prerogative to intercept illegal shipments in exchange for assurances that either the monitoring or the receiving country will eventually seize the contraband and prosecute its carrier. Second, European arrest warrants have provided member states of the European Union with a new legal avenue for bypassing cumbersome extradition proceedings. Third, legal norms prohibiting American-style undercover investigations have long constrained American and European law enforcement officials who work together on transnational undercover investigations. American law enforcement agencies successfully lobbied European governments to lift some of their legal restrictions on covert operations, resulting in ambitious regulatory reforms at the national rather than supranational level. But despite these legal changes, European legal systems still impose greater constraints than the U.S. legal system on what covert agents may do undercover. Thus legal constraints continue to matter to the ways in which the police design and execute transnational criminal investigations. Sociologists of law have long recognized that the law on the books differs from the law in action, a truism that is amply demonstrated, for example, in the midst of the current controversies over the meaning of “torture.” Laws against torture enshrined in international treaties and implementing legislation may have different meanings, whether one is in the hallways of the United Nations, the Pentagon, or Abu Ghraib prison. This relationship between formal law and what actually happens on the ground is complex, governed by webs of political, cultural, economic and social institutions, organizations and actors. It is the task of the sociologist to untangle these webs and identify the social processes that govern law and legal institutions. In his recent book, Policing World Society (2002), Mathieu Deflem offers a well-researched historical analysis of the development of international policing organizations, as well as a sociological perspective that sheds light on the current law enforcement efforts directed at global terrorism. Deflem is critical of predominant sociological theories that relate policing to the state’s capacity for social control. He argues convincingly that such theories render police organizations a mere instrument for achieving the state’s political goals, thus ignoring the institutional autonomy of modern policing (Deflem 2002, 6-10). Deflem offers an alternative account that links the development of policing institutions to social processes associated with the rise of the modern state, including bureaucratization and professionalization. Deflem notes that police organizations within nation-states have become increasingly bureaucratic, relying on a division of labor and emphasizing rational organization and efficient outcomes (Deflem 2002, 17-26). Moreover, policing has become increasingly professionalized, where police organizations lay claim to specialized knowledge and expertise and “operate on the basis of a legitimate system of rules and procedures” (Deflem 2002, 19). By emphasizing rationality and efficiency over political agendas, these two processes help render domestic policing organizations relatively autonomous from the nation-states which they serve. This institutional independence is necessary for international cooperation. If policing organizations are too embedded in a particular political regime, they will not find a commonality of interests necessary to transcend their narrow national interests and to forge international partnerships. Only when police begin to think of themselves as police – across borders – that meaningful international cooperation becomes possible. Deflem describes the Monaco Congress on international policing, attended by magistrates and diplomats from virtually every European nation (Deflem 2002, 107). He argues that these efforts failed to forge effective international partnerships in policing, in part, because as government representatives, the delegates were immersed in political matters of formal law, such as extradition treaties. Far more productive were international assemblies attended by police bureaucrats, such as the International Police Congress at Vienna in 1923, which eventually gave birth to Interpol. The representatives’ emerging sense of professionalism and their participation in police culture made collaboration across national boundaries possible (Deflem 2002, 125-8). Another important social force in Deflem’s book is globalization, where global concerns shape local issues while local problems, in turn, shape global priorities. Deflem’s book reminds us that globalization is hardly a new phenomenon. He shows that national policing agencies exchanged ideas, techniques and tactics through international conferences and organizations. The usefulness of emerging technologies in criminal investigations, such as fingerprinting and photographic identification, spread through these new networks (Deflem 2002, 93-4). On the other hand, “local” problems, such as political assassinations and the proliferation of prostitution, morphed into global threats of anarchism and “white slavery” through international police organizations (Deflem 2002, 65-9). Throughout his book, Deflem emphasizes the importance of autonomy and institutional independence in the expansion of international policing structures. Such autonomy has been a notable development in modern policing. Moving away from their historical foundations as armed enforcers for political machines, police have become experts in crime detection and investigation, capable of setting their own agenda, goals, and policies. Their bureaucratic structure and professionalism have allowed modern police organizations to shift their focus from politics to crime (Deflem 2002, 103). Yet Deflem shows that this shift in focus has been complicated, where the police can never entirely escape the state’s political agenda, particularly in the midst of the social and political problems associated with war. Deflem shows that when nations were at war, the police assumed national security tasks. Moreover, international police co-operation was limited in the face of the emerging political threat of global communism because of unsettled political conditions at the time. But when disruptive political conditions settled down, police were able to return to crime control and create lasting structures facilitating international co-operation (Deflem 2002, 111-23). Deflem’s historical analysis raises very interesting insights into the current “war on terrorism.” Terrorist organizations, such as Al Qaeda, are the latest in a long line of international terrorist threats, following anarchists, Bolsheviks, and Communists. Al Qaeda is engaged in jihad, acts of war, yet their attacks also constitute very serious crimes. Controlling terrorism requires the expertise of many different agencies, including the military, intelligence, immigration, and of course, law enforcement. The global nature of these terrorist acts requires extensive international co-operation, and given the bureaucratization and professionalization in modern law enforcement agencies, it is not entirely surprising to see extensive collaboration across national boundaries – something Deflem’s historical model would predict. In countering global terrorism, policing organizations around the world engage in a wide range of investigative techniques well within their expertise – tracking financial transactions in the global economy, conducting surveillance on suspected terrorist cells, and extracting confessions. To facilitate such tasks, the FBI has field offices around the world. Domestic law enforcement agencies have shared evidence and joined forces to shut down the financial networks that fund international terrorism. Working together, American, European, and international policing organizations have been responsible for the arrest and prosecution of some of the co-conspirators who planned and executed the 9/11 attacks. Yet Deflem’s model also predicts that politics can interfere with the effective administration of international efforts to coordinate policing. First, he shows that when national security is threatened, law enforcement agencies return to their political functions. In the aftermath of the terrorist attacks of 9/11, domestic law enforcement agencies have become instruments of the White House’s “war on terrorism,” pivotal to the mission of “homeland security.” The Patriot Act expands the FBI’s power to conduct wiretaps and computer surveillance and authorizes the FBI to gather information about private citizens from video stores and libraries without obtaining a search warrant. Moreover, on suspicion of terrorism, individuals are being held in detention indefinitely without being charged, and some suspects have even been transported to other countries whose regimes are willing to use torture. By carrying out these mandates, law enforcement agencies have been drafted into the Bush Administration’s heavily politicized anti-terrorism efforts. Deflem’s model also suggests that the re-politicization of law enforcement threatens international co-operation, and in fact, the political disruption and strained foreign relations that followed the war in Iraq have threatened cross-national collaboration in the prosecution of terrorists. Some of the co-conspirators in the terrorist acts perpetrated on 9/11 have been arrested in Spain and Germany. Although the United States sought their extradition, Spain and Germany resisted because of the military tribunals established by the White House for “military combatants” – a designation that might be applied to terrorists. Moreover, the American commitment to the death penalty makes other countries, particularly in Europe, reluctant to hand over criminals. The tensions created by these largely political issues make international collaboration more difficult. Yet Deflem’s model also suggests that this re-politicization of policing will be short-lived, and the law enforcement agencies will assert their independence from its political agenda when the threat of terrorism subsides. Still, our society will be left with lingering questions, not so much about the politicization of the police, but about how to assert political control over our law enforcement agencies. By amassing power through the development of expertise and by disappearing behind the legitimacy of an efficient, bureaucratic structure, policing organizations avoid the political responsibility associated with other branches of government. International police organizations are even further removed from political control (as Deflem reminds us in his account of the Nazification of Interpol). As Deflem establishes, depoliticizing the police has paved the way for a professional police force, international co-operation among domestic law enforcement agents, as well as international policing structures. But as we look to the future, we might imagine new institutions that make our policing agencies – both international and domestic – more accountable to the publics they serve. In an era where global terrorism is frequently framed as a crime rather than a political strategy, few issues seem as pressing as the international coordination of policing practices. In Policing World Society, sociologist Mathieu Deflem sheds much light on this formidably complex topic. His analysis examines the evolution and organization of cross-border efforts, achieving an important but rarely-realized synthesis of theoretical rigor and empirical insight. There are many lessons to be gleaned from this book, and it should be of considerable interest to students of policing and state policy as well as to practitioners in related fields. Deflem’s central argument is that international policing emerged through the achievement of bureaucratic autonomy, marked by policing agencies’ institutional independence from the political sphere. The nineteenth-century transition to modernity favored the formation of specialized (read: bureaucratic) policing organizations, and thereby facilitated the achievement of this sort of autonomy. Beyond this broad transitional dynamic, Deflem asserts that two constituent conditions are necessary. The first is the presence of structural opportunities, or environments that create the possibility for policing organizations to move beyond national confines. Such opportunities have historically been marked by the professionalization of policing – i.e. a commitment to formalized policing standards that allow the field to achieve some degree of independence from each agency’s respective government. The second key condition is the presence of operational motives, through which international cooperation fulfills organizationally defined goals. Practically, these motives are realized through the formation of organizationally-constructed “knowledge myths.” While these conditions may be necessary for the emergence of international efforts, Deflem also recognizes that such initiatives are far from stable, and thinks through particular dynamic processes that provide bases for change. Perhaps most important is the fact that cross-border efforts retain a national character, with national interests shaping and reshaping the agendas of participating policing officials. Most broadly, this framework is situated solidly within the policing, social control, and globalization literatures, incorporating important insights from each. At times, the analysis serves as a corrective to previous work, recognizing, for instance, that “globalization” has deep historical roots, and that cross-border links do not preclude the maintenance of overriding national interests. Deflem also rightly criticizes narrow functionalist accounts that conceive of policing outcomes as straightforward products either of state-centered political interests or economic processes “associated with the expansion of capitalism” (15). His model works within the broad tradition of comparative-historical analysis, developing a detailed account of US and German efforts from the nineteenth century onward. The theoretical focus on bureaucratic autonomy is rooted in the work of foundational social theorist Max Weber. This proves to be an exceedingly well-suited choice, as it allows Deflem to demonstrate that international police practices are “determined by internal organizational developments related to a process of bureaucratization” (15), while also remaining sensitive to the “external contexts in which bureaucratization takes place” (17). Concretely, this means that the account here incorporates negotiations within and across policing organizations, as well as links to external state and economic actors. Much previous policing research in this tradition – Kenneth O’Reilly’s work on the FBI comes to mind – has retained a normative orientation and a focus on a single organization. In contrast, Deflem here develops a comparative analytic account, which provides a vehicle to draw out several important insights about the bureaucratic process. First, the analysis allows us to acknowledge the constructed nature of organizational justifications of international policing activities. The fact that motives are negotiated within organizations is key, as such processes are unrecognized within functionalist or otherwise vaguely-linked explanatory accounts that have long characterized traditional state-centered and economic models. It also allows Deflem to retain a focus on the rational basis for these negotiations – here represented by each state’s national interests – and also to employ a falsifiable empirical framework to test the overall model. Finally, the comparative framework here provides leverage for demonstrating the role of structural conditions and organizational motives as they develop across cases and over time. This has considerable payoff when understanding the trajectories of the German vs. US cases, but is also extremely effective when explaining the differing outcomes of specific transnational policing efforts, including Interpol and the less successful US-based International Police Conference. Another seemingly important question involves the extent to which the emphasis on bureaucratic autonomy here be paired with a focus on bureaucratic process. How important is it to understand the internal workings of key agencies? For example, with the FBI, Deflem correctly notes that other studies focus unduly on Hoover’s psychology, but within the analysis here it is difficult to understand how the bureaucratic structure of the FBI impacted their internal decision-making. While these sorts of dynamics may best lay outside of the scope of this study (which can’t, after all, look at everything), its inclusion might also supplement our understanding of the Bureau’s orientation to agencies such as Interpol. We also know that many of the policing agencies involved with such international efforts have a parallel charge to protect national security. Readers of this book might do well to wonder about the interrelationship between these agencies’ international policing efforts and their decidedly state-centered security activities. Referring specifically to local policing agencies in the US, Deflem notes that they were “heavily influenced by partisan politics,” but that “democratic ideals prevented the police from formally pursuing political tasks” (97). Similarly, he argues that WWI and the rise of the Bolshevik threat should be understood as only a brief return to political policing. However, during the first half of the twentieth century, a durable counterintelligence infrastructure emerged within the FBI as well as in various local police departments (through their Red Squads, etc.). While these were generally unilateral efforts only minimally involving significant international collaboration, it seems important to reconcile them within a framework that views concurrent international efforts as increasingly crime-centered, standardized, and independent of the reach of national governments. These issues, however, do not take away from the impressive breadth of this book’s analysis. Its reach is largely a product of the impressive array of primary and secondary data that Deflem mobilizes throughout. Interestingly, in several places, he exploits what seems to me to be an interesting, innovative source – the academic/professional literature of the time – to understand the views of US and German policing agencies. Thinking about the disjuncture between the current policing literature in the US and much of what occurs within actual policing agencies today, such sources would appear to be of limited utility. But it may well be that the fractured relationship between academia and policing practice has increased over time, leaving open the question of how closely these published sources might be expected to represent the concerns actually being negotiated within particular agencies at the time. And, to the extent that the author’s response affirms his use of such materials, how might we explain the diverging paths that these institutional fields have traveled more recently? Finally, we must consider more directly what this historical study can teach us about future prospects for global policing efforts. Such a project seems especially urgent given the fact that these initiatives have obviously gained a renewed salience after September 11th. Certainly, the framing of global terrorism as, in Deflem’s words, “a crime stripped of its divisive ideological motives” (230), has far-reaching implications for cross-border alliances and programs. These dynamics are clearly of great interest to policing practitioners, and Deflem’s work in Policing World Society makes him well-poised to teach us much about how the evolution of international efforts should inform debates over policy and strategy. I am sure he is hard at work doing just that, and I, for one, am looking forward to seeing the fruit of that labor. It is a gratifying and humbling experience to have one’s work be taken so seriously that it raises comments and questions. The reviews my book has enjoyed in this Symposium have opened my eyes to many issues related to the theme and approach of my work, even though they were not explicitly present when I wrote the book, nor was I always aware of them. Of course, the readers may recognize the consequences of one’s work always better than its author can. The perceptive and critical reading of my book by the reviewers allows me to regret that they were not with me when I wrote the book. Fortunately they now offer some further food for thought that research on international policing can focus on in the future. Jacqueline Ross shows her sensitive and sharp analytical skills in presenting the main currents of international policing that are recounted in my book in relation to its sociological perspective and the various theoretical positions that are defended. Ross aptly describes my book’s perspective as challenging the rather simplistic and all too often assumed functionalist argument that policing merely responds to developments in crime. Hence, the formation of international structures of police cooperation would be attributed to the internationalization of crime. There are two important qualifications to my book’s challenge of this perspective. First, while a simple model of international policing as a mere response to international crime cannot be sustained, such is nonetheless the justification of the development of international police efforts by participating police officials. The reasons are that police gradually come to develop the expertise with which international crime can be efficiently responded to. Second, I would also clarify my position as an empirically tempered constructionism, i.e., a constructionist approach to policing that recognizes that constructions do not take place in a vacuum but must always rely on some empirical patterns and developments. Therefore, for instance, I attributed the failure of the International Police Conference to foster international police cooperation in the early 1920s to the simple fact that the international crime problem was at that time insufficiently developed in the United States, which remained largely isolated from the rest of the world as the modern means of transportation and communication were not yet as developed as they are today. The continuing persistence of nationally defined interests in international policing is a matter that Ross also duly highlights. It is in this context important to remind ourselves that public police organizations are always sanctioned by national states to resort to force to control crime and maintain order. In the modern world, police agencies cannot be understood outside the context of a national state. At the same time, however, modern police organizations also claim and gain independence from the governments of national states and in this sense become a-political. The simultaneous national yet a-political nature of policing is often not well recognized among scholars, though its implications are important. Specifically, this conception of policing leads one to differentiate between policing that is inherently political (as is typically the case in non-democratic nations) and policing that can be politicized (as can be the case in democratic regimes). In the latter case, the political nature of policing does not reveal a motive of the police itself but a consequence of a political pressure it is confronted with. Further inter-agency ramblings and competition among various agencies also relate to the degree to which such political pressures can be effectuated, as Ross cautions me to consider. The variable political structures across nations, police of which participate in international cooperation, will be relevant here. In this case, the differences between most continental European police systems and the US decentralized model will indeed have important repercussions for trans-Atlantic police collaboration. I am receptive to Ross’s critical remarks about the way in which I employ, too sweepingly, the notion of bureaucratic autonomy. Although I introduced the concept as a matter of degree, I never really articulate in detail when such a degree is reached that it allows for international cooperation, nor what the dimensions of bureaucratic autonomy precisely are. Nonetheless, I would hold on to the notion that a police organization with a high degree of professional expertise but lacking institutional independence will not be able to participate in international cooperation efforts that are widely multilateral. To be sure, there may be attempts to influence the global police agenda, but such efforts will fail if they are strongly political. The Nazi police did take control of the International Criminal Police Commission, but the organization also became a mere formal matter as there was no participation of police from hostile nations. Police agencies that are strongly influenced by the political dictates of their respective governments will also prefer to work unilaterally outside the context of any multilateral structure. It is true, as Ross points out, that such multilateral structures may play a rather limited anyway, even with independent police agencies. The conclusions of my book must be carefully understood to imply a theory of international police cooperation, but not necessarily a more general theory of policing. As a fellow sociologist of law, Anna-Maria Marshall offers a useful entry into my book by emphasizing my work’s position relative to legal and sociological approaches of law as rules that are enacted and enforced. As sociologists, we rarely start with the rules, and even less rarely do we end there. My book was in that sense also meant to offer a complement to a more traditional approach to international law by focusing not on norms but on the agencies that seek to control crime internationally. Marshall also discusses the concept and perspective of globalization as an important angle for my work. Indeed, it was in fact within a broader project on globalization that the study emerged. Within the globalization literature I found (and find) that there is too much emphasis on political and economic developments, much less so on cultural issues, and even less so on institutional arrangements in the areas of law and social control. The very act of researching police developments across nations is amazing to most scholars who study globalization. Furthermore, the variable forms in which international police work takes place, from unilaterally instigated transnational activities to bilateral agreements and global structures, show that globalization cannot be too readily understood in terms of the movement towards an ever-shrinking world. The dynamics are far more complex. A proper understanding of globalization is also critical when considering, as Marshall urges, developments in the contemporary world, especially since the events of September 11. On the basis of the model introduced in Policing World Society, I am focusing most of my recent work precisely on the policing of terrorism (see www.mathieudeflem.net). Worth noting in the context of Marshall’s comments is first of all that the policing of terrorism is indeed influenced by both the bureaucratization process as well as by attempts at politicization of police work. In the United States, for instance, the formation of the Department of Homeland Security takes on special importance when we consider it not only as an attempt to streamline and coordinate counter-terrorism agencies, but also as an effort by the federal government to oversee and control the nation’s counter-terrorist activities. But police agencies today are also more bureaucratized and professional than ever before, so that they can also better resist these political pressures. The outcome of these developments are central to the future of counter-terrorism. Also, taking a special look at Interpol’s role in counter-terrorism, certain issues are central from the perspective introduced in my book. First, as a cooperative organization that has no supranational powers, Interpol will necessarily mirror the limitations and characteristics of the various participation police systems. Interpol will always be as strong as its weakest link. It is probably most striking that the United States is very skeptical about Interpol’s role —no wonder, when the organization also purports to strive for global cooperation, including police from nations with which the United States does not see eye to eye on many important matters of politics and international security. Furthermore, in view of the emphasis on technological developments and efficiency considerations in international policing, it is rather remarkable how little advanced the communication systems are that are used at the Interpol headquarters. Shortly after 9/11, Interpol’s current Secretary General, Ronald Noble, admitted that Interpol’s communication system was “antiquated” and “clumsy to use.” Until recently, Interpol’s method of information exchange among the participating police agencies was to send out photocopies via the lowest-priority regular mail service. Although changes were recently made to move to an electronic system, not many member agencies participate in the system. It is not only because of technical shortcomings that Marshall is wise in reminding us that questions of legislative oversight and public accountability of police agencies remain very important. At an international level, such matters are even more pressing because it can be unclear which authority is in charge of such control and because many international activities are simply not well known. Besides the formation of international arrangements of law and politics, a globalization of civil society will also be indispensable. Fellow sociologist David Cunningham likewise opens his analysis of my book with reference to the theory of bureaucratization that I developed on the basis of Max Weber. Cunningham is careful in reviewing the two-step model that I use to differentiate between structural conditions and operational motives. Structural conditions allow police to cooperate, whereas operational motives actually lead to the formation of such international efforts. I must freely admit that I now regret somewhat the introduction of the term ‘myth’ to denote the meaning and function of international crime in international policing. A myth is important in its consequences whether it is true or not, but in everyday usage the term is often equated with a statement or story that is effective yet false. That is definitely not what I had in mind when I discussed the role of knowledge systems about international crime. Typically, however, the mere possibility of international crime will be sufficient to propel international police work. I am pleased that Cunningham highlights the fact that my work is in no way to be understood in normative terms. I do not argue for nor against the fact that international police cooperation is driven by concerns of efficiency rather than based on formal agreements between national governments. I merely recount how historically it was the case that international cooperation developed from the bottom-up on the basis of expertise claimed among police officials, rather than that it was top-down planned and overseen by certain arrangements of international law. It is astute of Cunningham to bring into the discussion his knowledge of the social movements literature that has suggested the framing of certain claims as an important process to account for why some claims are and some claims are not successful in mobilizing action. In terms of the police developments I discuss in my book, I would suggest that the answer lies at the intersections of police and law with politics and culture. Among the developments that deserve special attention, I speculate, are those issues that resonate broadly to affect various institutions and that will also find way into media representations and even the everyday world of citizens. For instance, it is striking that as early as 1913, a German police officials already referred to international policing as a new buzzword. Similarly, the anarchist of the 19th century and the international thief of the 20th century enjoyed a certain publicity across social institutions. The omnipresence of the terrorist in our present age is another case in point. Finally, I have to agree with Cunningham that my book has little to say about actual practices of international criminal investigations. The focus of my research is indeed on the organizational dimensions of international policing strategies rather than the actual implementation of international police plans ‘in the field’ or the experiences of the agents conducting such activities. This delineation of the research focus is primarily inspired by concerns of feasibility and the nature of the data collection methods, but it also makes sense as a sociology of organizations. And it is important to not think about policing as just cops making arrests. Yet, I must admit that my focus restricts the generalizability of research findings and cannot lead to any rigid inferences from research results about organization to speculations about practices or experiences. Although it can be assumed that concrete policing practices are guided by a formally established organizational design that specifies the boundaries of what can and cannot be done, police professionals with experience in the field of international police work will have much more valuable things to say. Should they be interested in my sociological work, their complementary feedback would be most helpful to our understanding of international policing.